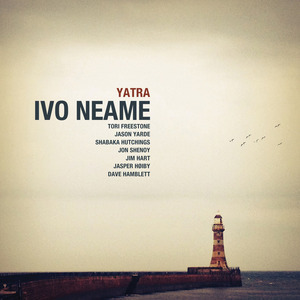 Yatra is Ivo Neame’s latest work on Edition Records. Yatra means pilgrimage or journey, the perfect word to describe a musician’s search for his own voice. We have waited quite a while for this album as Ivo’s last in his own name was 2009 (Caught in the Light of Day – you can see my review here). I am more used to seeing Ivo in smaller bands – with Phronesis, Josh Arcoleo, Kairos 4Tet and Marius Neset’s Golden Xplosion so a work with eight musicians (and no standards to call on) felt on the face of it, well, rather audacious, risky and brave. But having seen Ivo’s Octet on stage twice – first in February this year in the Purcell Room and then more recently in the sympathetic environment of Kings Place, the word audacious is wrong – it wasn’t risky at all, it feels very natural now. In February I thought “There are moments of genius in this, what a lovely complex sound but I can still follow it”; in March I heard Ivo’s quintet in Sherborne and listened to the buzz afterwards (“That was the best gig we’ve had in Sherborne for ages”); and just a week ago I thought “Wow, this has grown up a lot”. Yatra consists of nine tracks, all by Ivo, with band members listed below. The most obvious point of connection to his 2009 quartet is Jim Hart on vibes and Jasper Høiby on bass, providing the solid foundation on which to add the new layer of four reeds and an accordion. The result is an explosion of colour and texture, richness and depth. The reeds add a romantic layer which combined with vibes give it a very beautiful sound best heard on Heart Murmurs. All the tracks stand alone but my favourite is That Syncing Feeling. It has the loveliest, achingly subtle melody on clarinet, a purring gently bouncing bass and sparce piano setting the tone. The reeds section is at its most sublime, serene and cool. In my mind I see a girl leaving home, she looks back over her shoulder and sees the boy at the window wistfully gazing after her, but she keeps walking. It feels sad. I like that. But then Ivo pushes us into the circus/fairground with Owl of me, with its funny noises and quirky dance rhythms. He’s playing with us! Moody seems to continue the circus feel, with more squeaks and hoots, clip-clops like a horse, it all feels a bit insane, suggesting psychological ups and downs, but then the tune breaks through which you will hum for days. It’s very clever. I think the genius of this album is that Ivo has a light touch with his fellow musicians. You are never aware of solos, it’s not formulaic, it’s democratic but not obviously so, it works as an ensemble. It ebbs and flows naturally, nothing is forced. Ivo has arrived at the end of this particular journey. I’m very pleased that he has found his own distinctive voice: witty, modest, serious, cerebral, poetic and self-deprecating, but also fun. It’s fabulous.